Racing into the New Year of my Art Life! Welcome to the new year! It’s that time of year when we all clean out the studio, mark up the new diary and set up for the year ahead. While clearing out all those dried up paints and worn out brushes it can help to review your art journey over the past year. I admit, I am happy to be done with 2018. It seemed filled with far too many challenges. That said, my year was also compiled of many highlights from progressive students to new art friends, connections and experiences. I have learnt many new things over the past year and I am happy to say that many of my challenges were decisions I had to make about the progress of my art life. And in my book, that’s a kind of success in itself. Having to make those kinds of decisions, what shows to enter, what works to paint and what exhibits to see, is a whole lot better than worrying about your timesheet or how many people you had to impress to get your brochure design over the line. 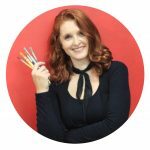 The lesson is to look over the last year and see what I have learnt from all the ‘changes’ and how they can inform my own art making and focus. It feels like I have moved on a bit. I no longer look at my work as a product of who I am so much. It’s an output of what I want to improve, what I want to get better at. Some of it will feel successful, most of it will be hard work and some will feel like I have not made any progress at all. The reflex I have now put into play is, that it all matters. 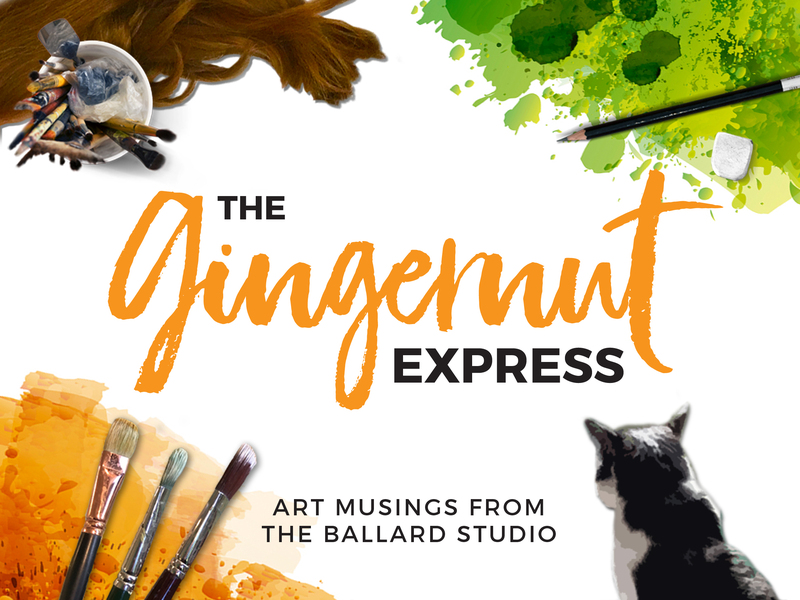 Every extra blog, bit of paint I have rubbed off, show rejection, artwork hanging and homework I have done to prep an art class, is an ingredient that goes into the mixing pot of being a professional artist. Of course, I admit, there are some things I could have easily missed, but to be honest, I don’t really know if they may help inform my decisions in the future? I will just have to wait and see. When I look at others who I admire, who excel in their own creative fields, I can now detect that this shift in mindset is very much the way they think too. They have no desire to show to the world how brilliant they are at what they do, their motivations are driven by a desire to get better at the things they can’t do. One of my teenage students came back to me one day with one of the best replies I have heard when I asked him what he wanted to achieve in his next artwork … he was quick to correct me … “I don’t want it to be easy, I want it to be good!” Oh how I wish I had such clarity with the direction of my own motivations in my younger years. And these are the guys I want to sit on the couch with! This pursuit for creative growth, this eagerness to use your time to get better, to improve your craft is the thing that separates the professionals from the hobbiest. The professional is never content because they are always on a quest to improve. For those around us, it seems very exhausting. They don’t understand why we put ourselves though it. 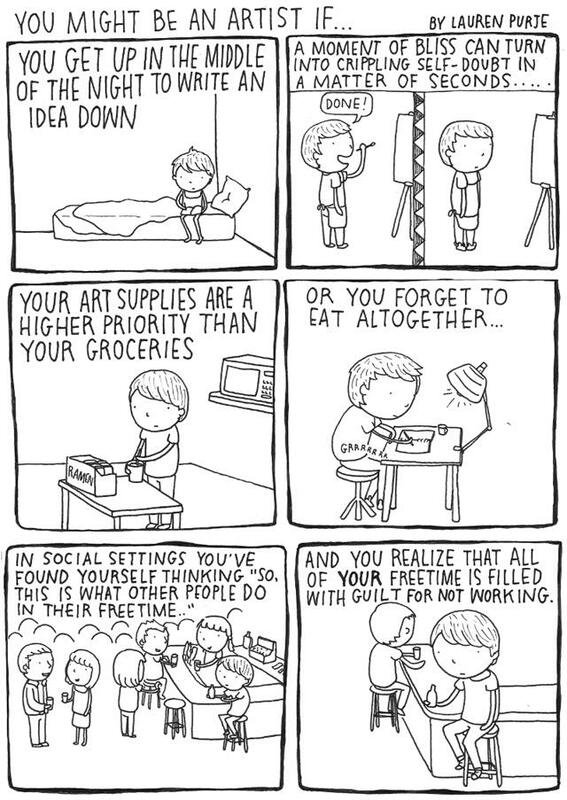 For the artist, we know it’s worth it. We can’t help it, we have always been creating (even if it was only in our mind). We don’t know how not to do it. My ambitions for this year include consciously getting myself onto more of these ‘creative couches’. I know it makes me feel more motivated, in a way, it’s a kind of art therapy. What has become apparent is that you don’t have to go far to do this. You can start in your very own art space. 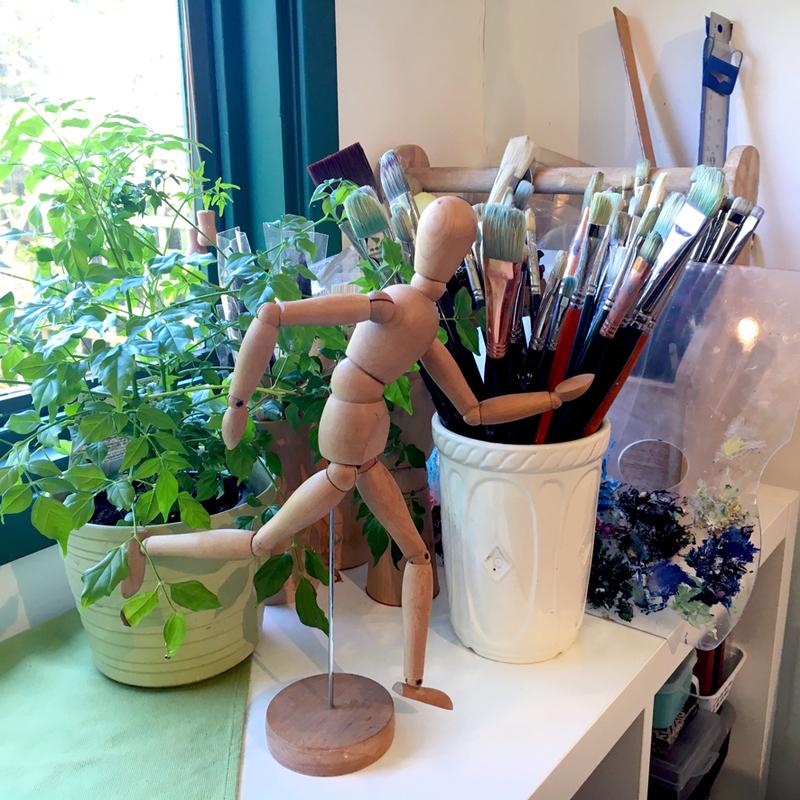 Cleaning up your studio or art space is the easiest place to start! Reading an art book, an art mag, making your space easier to work in and organising your materials can all help your brain maintain a creative conversation. Even rearranging your space so that you have a nice view, even a view of a picture on your wall can help. For many of my students I suggest an art date. Take yourself to a coffee shop or the park, take an art book or a note book. Scribble, journal, read up. It doesn’t matter what you do, as long as you spend a little time doing it. It could even be sharpening your pencils for your next art class. All that matters is that you spend time doing it. It is sure to make you feel like you are in a creative life rather than putting it at the end of your ‘to do’ list. 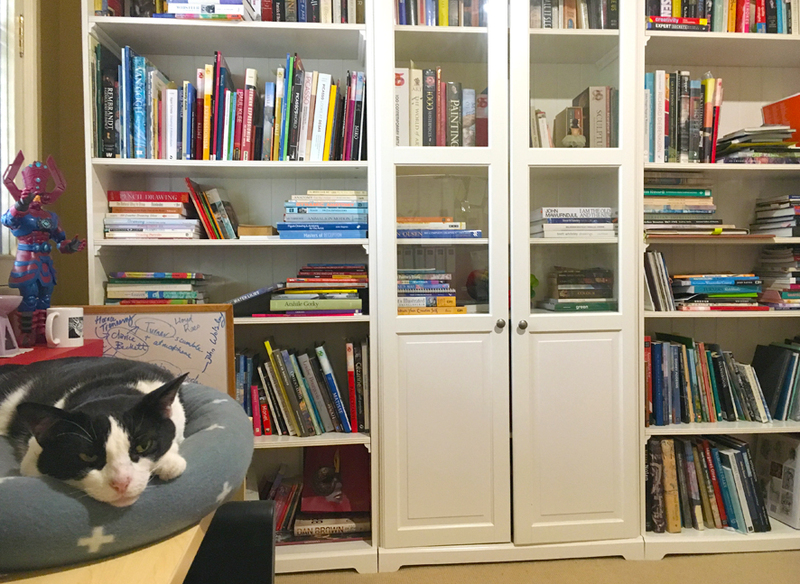 Look at the enthusiasm ‘Sketch’ my inhouse art critic, is exuding by overseeing my clean up of the art bookcase……still in progress! A great help for any artist wanting to get organised. Need some help sorting out your art stuff! Check out this book! 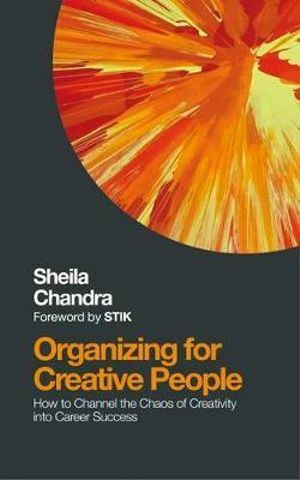 Great ways to tackle the unique organisational challenges that artists face. To those lovely folks who have heard me bang on about some of these topics before I send my apologies. It is sure to happen again as I bang on a lot!